Greek style oven roasted chicken is one of my mother-in-laws favorite meals to make for us when we were coming home for the weekend. The lemon chicken along with oven roasted potatoes cooked in a rich tomato sauce. Preparation and cooking time is about 2 hours but well worth the effort. While the potatoes are roasting I fix a Greek salad or prepare a vegetable to go with the meal. It is very easy to double the recipe if having company for dinner. And it doesn't take any longer. Clean and rinse chicken. Pat dry with paper towel. Place whole chicken in roasting pan on its side and rub oil over entire bird. Squeeze the lemon juice all over and sprinkle the spices and herbs on both sides. Place in temperature ready oven for 15 to 20 minute to brown the pan. Watch closely so not to burn the bottom. Once pan has a nice rich brown color add hot water to deglaze the pan which will make a basting liquid. Lower temperature to 375° for remainder of roasting time, basting every so often. Once chicken is nicely browned, turn it over to finish the roasting time so the other side gets nicely browned. While chicken is roasting, peel and cut the potatoes into 6 to 8 long pieces and keep in cold water until chicken is done roasting. In a 2 quart sauce pan prepare the tomato sauce. Mix the tomato sauce, paste, spices and water. Bring to boil and reduce heat and simmer for 20 minutes. When chicken is done to desired temperature, move chicken from pan to a dish and cover with foil to keep warm. Pour the basting liquid into a small sauce pan. Add a little hot water to the roasting pan to deglaze. Remove excess fat from basting liquid in small sauce pan, putting it back in the roasting pan for the potatoes. Pour the prepare tomato sauce into the roasting pan and add the sliced potatoes. Put back into a 400° oven until done. Moving and basting the potatoes once in a while. Add hot water if needed. The liquid in the small sauce pan is for gravy at the table. 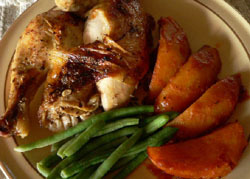 You can can thicken flour or cornstarch or leave as is to ladle over the oven roasted chicken and potatoes at the table.